LATER THIS WEEK: JUTP joins Burtonsville boosters for a buffet dinner with your District 14 delegates in Annapolis. 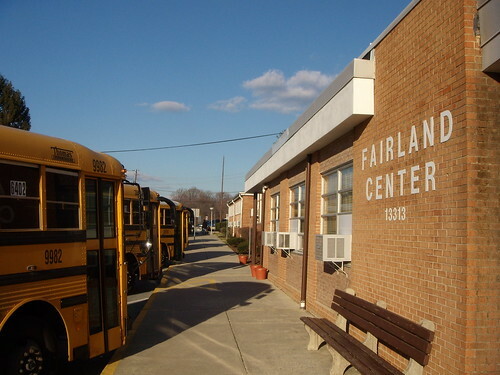 Buses line up outside the Fairland Center (currently home to Galway Elementary School) after school January 3rd. - We were alerted to another new local education blog over the weekend: The "More" Child, written by an East County resident and parent whose frustration with Montgomery County's gifted-and-talented programs led her to put one of her daughters in homeschooling. As a product of MCPS' heavily flawed Center Programs, I'm glad to see that other people are writing about the huge gap between what is advertised and what you actually get. - A group of Whitman High students have started a Facebook group protesting the County's decision to eliminate the "Kids Ride Free" program, enabling students to take Ride On buses without paying fare. Over 460 students, most of whom appear to be from inside the Beltway, have joined. - To gather support for the Purple Line and public transportation in general, the Action Committee for Transit has decided to explore ways of student outreach. "Students are tremendously supportive of the Purple Line and we need to make sure that voice is heard," said President Ben Ross at their monthly meeting, held last Tuesday at the Silver Spring Center. Noting the student outcry over the Kids Ride Free cuts, ACT chose not to speak out against it specifically themselves. "We need to have students take the lead and make some of the judgments," added Ross. - Eleven Ride-On routes will see reduced service or be cut altogether this year, according to last week's Gazette. With the exception of Route 127, which serves the Takoma Park and Rockville campuses of Montgomery College, not one of the dropped routes currently serves East County. I'm surprised that the convoluted Route 21, which premiered last June, has scraped together enough riders to stay around for a full year. Thankfully, Thayer Avenue's blessed 20 bus to Hillandale survived the knife. I would have been surprised if otherwise, as it's almost always packed.